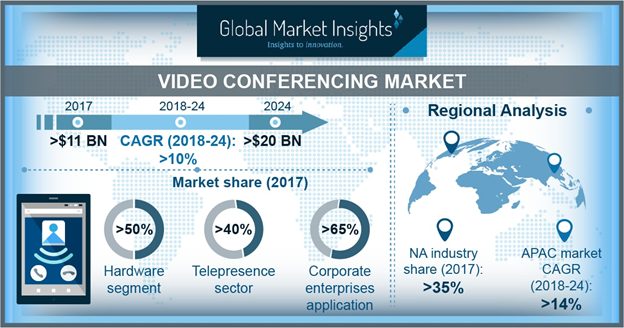 Video Conferencing Market size is set to exceed USD 20 billion by 2024; according to a new research report by Global Market Insights, Inc. The video conferencing market is propelled by the rise in globalization. The current scenario of globalization has witnessed closer relations between the countries, regions, and districts. This has allowed the multinational organizations to grow while enhancing their communication & collaboration frequency between the companies. The corporations are relocating their workplaces to distant locations to take advantage of the supportive regulatory policies and resources in various regions across the globe. Moreover, as the number of remote workplaces increases, the need for a unified communication and collaboration solutions among enterprises also rise to foster teamwork between the employees at different locations. The falling price of the video conferencing products is also driving the growth in the market. Most of these video conferencing systems are providing basic essential features such as text chat, video chat, and the ability to share documents & applications. The prices of these formerly expansive systems have changed over the last four to five years. The vendors in the market are following entry-level pricing models ranging between USD 8 to 40 per month. In addition, many companies are offering trial periods or free usage tiers with basic features. The hardware accounted for over 50% of the video conferencing market in 2017. Hardware market includes the Multipoint Control Unit (MCU), codecs, and peripheral devices. The market growth is credited to the high adoption of MCUs among enterprises due to the increasing need for high interoperable video conferencing systems. It coordinates media stream processing parameters between multiple endpoints. On the other hand, the software market is anticipated to grow at a CAGR of 14% over the projected time frame. The growing demand for cloud-based video conferencing solutions and mobile applications among the corporates is driving the market. The increasing adoption of BYOD policies and enterprise mobility also promotes the demand for software solutions. Moreover, the benefits offered by the cloud models, such as cost-effectiveness, flexibility, and scalability, also augment the demand for the cloud software. The desktop segment is expected to grow at a CAGR of 14% over the forecast timespan. The smart businesses and organizations have moved beyond static workplaces and are adopting mobile workforces. The emergence of affordable, reliable, and powerful smart devices has shifted the focus of the business industry toward mobile video conferencing applications. The video conferencing service providers, such as Polycom and ezTalks, are offering easily downloadable mobile applications that can transform mobile devices into video conferencing workstations. The startups in the market are offering freemium models to increase market penetration. In addition, the widespread adoption of smartphones and the advent of 3G and 4G technology across various locations are also fostering the growth of the market. Video conferencing is used widely across corporate enterprises, educational institutions, government organizations, and healthcare establishments. The education market is predicted to grow at a CAGR of 14% over the forecast time period. The widespread adoption of video tutoring and online education platforms is the primary factor driving the demand for video conferencing solutions among the education institutes. The healthcare market is also projected to attain a growth rate of 15% over the projected time frame. The advent of mHealth and Telemedicine concept across the countries is the major force driving the adoption of video conferencing among the healthcare sector. The Asia Pacific video conferencing market is expected to register a CAGR of 14% over the projected timespan. The supportive government policies in the region are expected to nurture the growth of the market. The increasing consumer use of software-based and cloud-centric video conferencing services is enhancing the growth of the market. Moreover, the growing adoption of the video conferencing solutions among the SMBs is also driving the market growth. The players operating in the video conferencing industry are Cisco Systems, West Unified Communications Services, Polycom, Adobe Systems, Arkadin, Logitech, Microsoft, Vidyo, ZTE Corporation, and Huawei Technologies. The market is highly fragmented and the players in the market are focusing on forming partnerships with other companies to increase their market share. The major players, such as Cisco, are offering a complete range of dedicated video conferencing endpoints as a part of their comprehensive product portfolio. The companies are also extending the value of its product line through key partnerships. The companies in the market are conducting strategic acquisitions of expert companies in the market to strengthen their product capabilities and increase their market share. For instance, in January 2018, Polycom announced the strategic acquisition of Obihai Technology, a company that develops software and hardware for VoIP endpoints. This acquisition will allow Polycom to compete more effectively in the global voice market and expand its product portfolio to include complementary technologies. How have the dynamics of video conferencing industry been transformed on account of the rising popularity of the cloud & the escalating demand from corporate enterprises?